A comic book portrays a story through a series of sequential illustrations that incorporate short bits of text containing dialogue, sounds, or narratives. The story may be humorous, or it may present a world of adventure, mystery, or fantasy. Most comic books are printed on a regular basis and have one or more central characters who appear in each issue. A particular story may be told in a single issue, or it may continue from one issue to the next over a period of time. The artistic style of a comic book is often attributed to a single artist, although most comics are produced by a team of artists and writers working together. The use of sequential illustrations to tell a story dates to prehistoric times when early humans painted series of images on rocks and cave walls. Egyptian hieroglyphics are another form of sequential illustrations that tell a story. Hand-drawn illustrations appeared regularly in newspapers and magazines starting in the 1800s. Many of them used humorous or un-flattering portrayals of well-known people and were the origin of modern cartoons and comics. The first newspaper comic strip in the United States was Richard Felton Outcault's "The Yellow Kid," which appeared in the Hearst New York American on February 16, 1896. It was published in the Sunday supplement to the paper and was quickly joined by other comic strips. By the 1910s, the Sunday comics were so popular that newspapers would occasionally publish small books containing reprints of past strips, which they would distribute to promote the paper and gain new readers. Soon, other publishing companies were assembling comic strips from several papers and selling them to merchants to be given away as premiums. In 1934, Eastern Color Printing Company decided to sell these books directly to the public for 10 cents each. American News, which controlled distribution to newsstands throughout the country, initially refused to handle the books, so Eastern Color took them to chain stores and quickly sold 35,000 copies. Faced with this astounding success, American News reconsidered and ordered 250,000 copies of Famous Funnies No. I from Eastern Color. It went on sale in July 1934 and became the first regularly published comic book to be sold at a newsstand. During the late 1930s, many of the now-famous superheroes made their first appearances in comic books, and comic book sales soared as good triumphed over evil. By the early 1950s, however, readers grew tired of superheroes, and some comic book publishers turned instead to lurid crime and horror stories with graphic illustrations. Some people felt this material was unsuitable for children, and the comic book industry came under public criticism and federal investigation in 1954. In response, many comic book publishers banded together and issued the Standards of Comics Code Authority, which defined appropriate material for comics. Creating a comic book is a detailed process that includes drafting the plot, designing thumbnail sketches and then the original drawings, and finally adding color and lettering. business that includes movies, television series, toys, costumes, and many other items. During the preparation of a comic book, a variety of art materials may be used to create the original hand-drawn page masters and color guides. These materials include various sizes, weights, and finishes of paper, as well as several different drawing mediums including pencils, inks, markers, and paints. After the master pages have been scanned and colored on a computer, the computer uses the color guides as a reference to generate four pieces of plastic film that are used in the printing process. The actual comic book itself is printed on a variety of papers using four colored inks—cyan (pronounced SIGH-ann, a shade of blue), magenta, yellow, and black. These four inks are printed in an interlocking pattern of tiny dots, which our eyes perceive as various colors. The printed comic pages are then bound together with staples or glue to form a comic book. Because each new issue of a comic book requires new artwork, the design process is part of the manufacturing process. The exception is when a new comic title or series is first introduced. That design process involves the same creative and artistic abilities required to produce any new work of art and may include idea generation, preparation of sketches, and the development of a series of refinements before the final characters and themes emerge. The final product of the initial design process may be a prototype comic book known as an "ashcan," a term that was first used in the 1930s when comic book publishers sought to protect new titles by copyrighting them. Rather than take the time to develop new characters or plots to go with the new title, a publisher simply took pages from a previous comic book and pasted the new title on the cover. Once the publisher was granted a copyright, the pasted-up prototype was often thrown in the ashcan—a metal container used to dispose of ashes from the stove or fireplace and commonly found in many households and businesses of that era. The concept of the ashcan was given a more modern meaning in 1984 when one comic book creator produced a limited number of black and white prototype comics for his friends and staff. In more recent times, several publishers have released small runs of ashcans in a variety of sizes and colors as promotional items for the full-production versions. Comic book publishers may be small, independent operations that produce a single comic book title on an irregular basis, or they may be large, well-established companies that produce several comic book titles every month. The manufacturing process varies depending on the size of the operation and the equipment available. Here is a typical sequence of operations that a medium-sized company would use to produce a comic book. Charles Schuiz was born in Minneapolis, Minnesota, on November 26, 1922. After World War II, Schuiz freelanced for a Catholic magazine and taught in the correspondence school, renamed the Art Instruction Institute. His work appeared in the Saturday Evening Post, and eventually he created a cartoon entitled "Li'l Folks." The United Feature Syndicate of New York proposed publication of Schuiz' "Li'l Folks," but it was renamed "Peanuts" by the company. In 1950 the cartoon made its debut in seven newspapers. Within a year the strip appeared in 35 papers, and by 1956 in over 100. 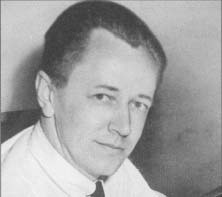 In 1955 and 1964, Schuiz received the Reuben award from the National Cartoonists Society. By 1965 "Peanuts" appeared in over 2,300 newspapers and the classic cartoon "A Charlie Brown Christmas," produced by Bill Melendez and Lee Mendelson, won a Peabody and an Emmy award. Schuiz also received the Yale Humor Award in 1956, and the School Bell and National Education Association awards in 1960; plus honorary degrees from Anderson College in 1963 and St. Mary's College of California in 1969. A "Charles M. Schuiz Award" honoring aspiring comic artists was created by the United Feature Syndicate in 1980. The year 1990 marked the 40th anniversary of "Peanuts" and the Smithsonian Institution featured an exhibit titled, "This Is Your Childhood, Charlie Brown…Children in American Culture, 1945-1970." By the late 1990s the syndicated strip ran in over 2,000 newspapers throughout the world. Schuiz died on February 12, 2000, the night before his last original "Peanuts" strip ran announcing his retirement. 1 Although most people think of a comic book as a series of pictures, it is the written plot that gives the story its direction. The writer and artist discuss the proposed story and exchange ideas. At this stage, they may use a number of formal or informal techniques for developing ideas. They may make notes on small index cards arranged on a table or they may outline the flow of the story on a display board. During the course of their discussion, they decide on the situations, locations, characters, and other details of the story. This helps define the overall plot from beginning to end. 2 Because most comics have a fixed number of pages, the writer and artist must then decide how to break up the story to fit each page. They discuss which scenes and dialogue are critical to keep the story flowing and how the characters and action should be depicted to have the greatest impact. Sometimes they follow general industry practices, which define such things as the optimal number of action scenes per page or the amount of dialogue per word balloon, but other times they rely on their own personal style. 3 Once the story has been refined, the writer creates a script. This includes general descriptions of the scenes and characters in the order they appear, the accompanying dialogue or descriptive text, and general instructions to the artist. The result is very much like a script written for a movie or play. 4 The artist reads the script and makes a rough sketch of each page, called a thumbnail. The thumbnail helps the artist decide how each scene should be depicted, and how the different scenes should be arranged on the page. Some artists sketch each scene on a small piece of adhesivebacked note paper and then move them around on a larger piece of paper to achieve the desired effect. 5 Using the thumbnail as a guide, the artist begins drawing each page in pencil. Some artists like to work on standard 8.5 x 11 in (22 x 28 cm) white paper and then photoenlarge the pencil drawings onto 11 x 17 in (28 x 43 cm) illustration boards before inking the final copies; others make their pencil drawings directly on the larger boards. The artist usually starts drawing the main elements of each scene with a hard pencil that makes very light lines. When all the main elements are in place, the artist considers the overall effect and makes any changes before proceeding. 6 The artist then darkens the main elements with a softer pencil and adds the backgrounds and other details. Areas for the dialogue balloons, sound effects, and narrative boxes are blocked out in blue pencil to distinguish them from the illustrations. 7 At this point, an editor may review the pencil drawings and make changes. Sometimes the editor may ask the artist to redraw a portion of a scene to correct an error or clarify an item. In other cases, the editor may have to shorten the dialogue or narrative to fit in the space left by the artist. 8 When the pencil drawings are complete, they are enlarged onto 11 x 17 in (28 x 43 cm) illustration boards if they were drawn on smaller paper. They are then sent to the inker. The inker's job is much more than just tracing over the pencilled lines of the artist with black ink. It involves the selection of line widths, adding shadows, visually separating the foreground from the background, and creating special effects like splatter or wash to give the illustrations texture. The inker uses a variety of pens and brushes to produce a finished black and white page. Many inkers have their own unique style that adds to the artist's original drawings. 9 The final step in the drawing process is adding the lettering for the dialogue, sound effects, and narratives that appear in the script. This can be done using hand lettering, adhesive labels, or computer-generated digital type. The letterer selects a typeface that not only conveys the actual words or sounds, but also conveys the action or emphasis of the scene with its size, style, and placement. 10 The finished pages, including the front and back covers, are sent to the colorists who add the colors and prepare the four-color separation films required for printing. The original artwork is first photocopied and then scanned into a computer. The photocopy is hand-colored using colored markers, pencils, and paints to become a guide when coloring the pages on the computer. The scanned copy becomes an electronic file that forms a digital outline of the page to be colored. 11 With the color guide as a reference, the colorist begins to add colors to the digital outlines of each page starting with the backgrounds and working forward. This is done using a custom software package that allows the colorist to trace the outline of any part of the image with the cursor, and then apply and blend colors to that area to match the color guide or to achieve a special effect. For many colors, the computer already has the information on file. For example, if one character always wears the same clothes, information about the colors of that character's boots, mask, or cape are stored in the computer to ensure they look the same from one issue of the comic book to another. 12 As the colorist selects and applies each color, the computer automatically assigns a code to it. This code is used to identify the four color components that make up that particular color—cyan, magenta, yellow, and black. When these four colors are printed in an interlocking pattern of tiny dots, our eyes perceive them as hundreds of different colors, even though there are really only four colors of ink on the page. The color variations depend on the concentration of each of the four color components. Thus a particular shade of red may have the code M80Y87, for example, which represents 80% magenta and 87% yellow. 13 When all the pages have been colored, a proof copy of the entire comic book is printed from the computer for final review and approval. The computer then prints a piece of plastic film for each of the four component colors on each page. Each piece of film has hundreds of thousands of tiny dots to represent the location and concentration of that color component across the page. 14 The individual pages are arranged so they will appear in the proper order when the comic book is assembled. Usually, two or more pages are printed on each side of a single sheet of paper. For example, page 2 might be printed on the left half of a sheet and page 23 would be printed on the right half. On the other side of the sheet, page 24 would be printed on the left and page I would be printed on the right. On the next sheet, pages 4 and 21 would be printed on one side, and 22 and 3 would be printed on the other. And so on. When the sheets of paper are stacked on top of each other and folded in the middle, the pages appear in the proper order. On some printing presses, as many as eight pages can be printed on each side of a large sheet, then cut and folded as required. 15 The plastic films for the four colors on each page are used to produce four aluminum printing plates. A bright light is projected through each film and onto the plate, which is coated with a chemical that is sensitive to light. Where there are dots on the film, they block the light and the chemical remains on the plate. Where there are no dots, the light passes through the film and burns away the chemical. This process is repeated for all of the pages that appear on each side of a single sheet (see Step 14). 16 The plate for the first color on the front side of the sheet is fastened around a circular drum in the printing press, and the plate for the back side is fastened around another drum below it. When the press is turned on, water flows over the rotating plates, while rollers with colored ink press against them. Where the chemical dots remain on the plates, the ink sticks; where the chemical has been burned away, the ink washes off and doesn't stick. The sheets of paper are fed between the rotating plates, and the front and back (top and bottom) sides are printed at the same time. 17 This process is repeated for each of the four colors. In some presses, a long roll of paper is fed between four sets of rollers, and all four colors are printed in a single pass through the press. 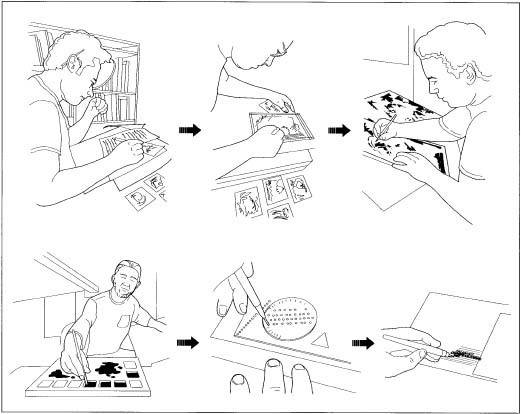 The printed sheets or the roll of paper are then cut to the proper size, stacked, folded, and stapled or glued to form the finished comic book. The future of comic books looks as dynamic as some of its superhero characters. Comic books offer a visual portal into a world of humor, action, and adventure that can stimulate a reader's imagination. Alvarez, Tom. How to Create Action, Fantasy, and Adventure Comics. Cincinnati, OH: North Lights Books, 1996. Allstetter, Rob. "Fire Drill." Wizard (September 1996): 48-51. Grant, Paul J. "Brush Off." Wizard (August 1995): 52-54, 56. Grant, Paul J. "Letter Perfect." Wizard (February 1996): 44-47. Tiemey, Matt. "Separation Anxiety." Wizard (January 1996): 40-43. White, Paul. "In the Can." Wizard (February 1994): 86-89. Comic Art and Graffix Gallery. http://www.comic-art.com (September 18, 2000). Comic Book Fonts. http://www.comicbook-fonts.com (September 30, 2000). The Comic Page. http://www.dereksantos.com/comicpage (September 30, 2000). International Museum of Cartoon Art. http://www.cartoon.org (September 18, 2000). Words and Pictures Museum. http://www.wordsandpictures.org (September 18, 2000). what kind of pen do you use for the inking on the comic book? by saying that the artwork is then colored on the computer, does that imply that everything is vectorized or is it just digitally painted and in that case can't one just use magic markers?